Glenn Meade’s latest offering is a modern geopolitical thriller that mixes ancient beliefs, historic texts, and age-old power struggles, reflecting recent headlines and tapping political and religious hot buttons. Archeologist Jack Crane is working at a Qumran dig, near the site where his late parents worked twenty years earlier, when his team discovers a 2,000-year-old parchment. Initial translations suggest potentially scandalous inscriptions regarding an imposter Jesus Christ—a second messiah. Before the document can be completely translated, the head archaeologist is murdered and the parchment stolen. Investigators name Jack the primary suspect. Despite having Israeli policewoman Lela Raul, an old friend who also knew his parents, questioning him in the murder investigation, Jack pursues the manuscript from Qumran to Syria to Rome and back to Israel. His search for the scroll—and for truth—takes him into ancient Roman catacombs and secret Vatican libraries. It also places him in the crosshairs of dangerous men with much to lose should he recover and publicize the scroll. Weeks before Jack’s surreptitious journey takes him to Rome, the Eternal City had celebrated the election of a new pope. Formerly the American priest John Becket, Pope Celestine VI seeks a new era of honesty, openness, and confession within the Catholic Church. He proposes, to the horror of many church leaders, to open the vaults containing both ancient and recent records—financial, theological, and historical alike. If he is successful in this quest, he risks revealing his own secrets, ones that have haunted him for twenty years. But the behind-the-scenes powerbrokers don’t want any secrets revealed, personal or private, and newly discovered scrolls that might cast doubt on foundational doctrines of the church are fair game in this deadly winner-take-all. 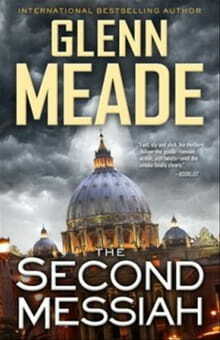 Meade knows how to entangle, and untangle, an exciting array of characters and plots guaranteed to keep the reader hooked. What does the scroll really say? How exactly did Jack’s parents die? How does the new pope connect to them? Will this controversy truly threaten a worldwide, 2,000-year-old institution? The mysterious, fascinating realm of biblical archaeology invites the reader into a wilderness simmering with anticipation and possibilities. Meade successfully paints a sunny, hot, and dusty desert that, despite its inherent discomforts, captivates lovers of antiquity for all the treasures it hides beneath its sandy surface. A talented storyteller, he sets the scene quickly before taking off on a rollicking ride that keeps the pages turning. It’s a hard book to put down. Seamlessly mixing fact with fiction, Meade leaves the reader wondering how much of the story could possibly be true. His author’s note reveals surprising and extensive research. Characters and their motives are well developed. The romance, not so much. While he lays the foundation for Jack and Lela to move beyond mere friendship, Meade’s attempts at romantic dialogue and emotion are stilted at best. The characters’ relationship disappoints in the end. But individually, they shine. The story doesn’t need romance anyway—it stands beautifully on the tension that fairly twangs as Jack races to mediate between truth and power.